Today we lost Leonard Nimoy, and even though he lived a long and rewarding life, I am still deeply saddened. 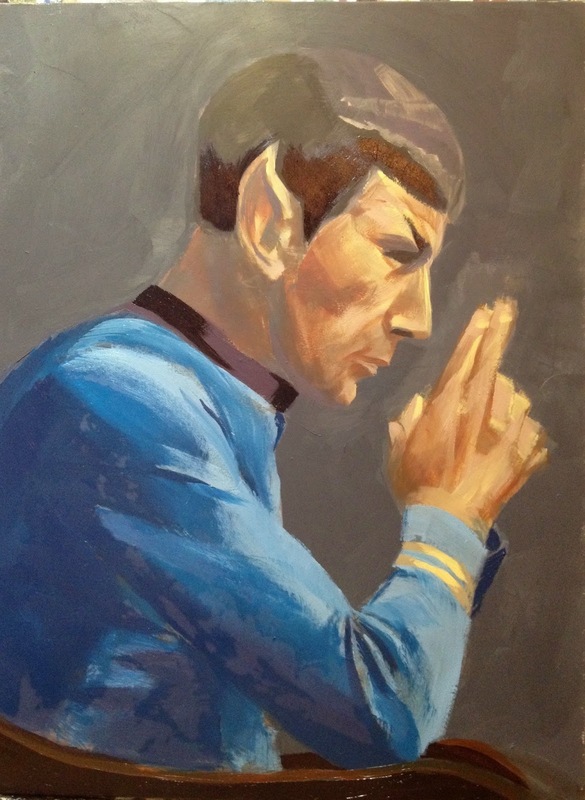 Understandably, the obituaries and articles and tributes today have focused largely on his decades-long portrayal of Spock in Star Trek, and touched lightly on his other accomplishments inside and outside of film. But to me, Mr. Nimoy wasn't just Spock, but Star Trek itself. Two years ago I wrote in this space that although Gene Roddenberry created Star Trek ("It's Bonanza in space! "), Nimoy and, later, movie producer Harve Bennett and writer/director Nicholas Meyer were actually better stewards of the franchise. That remains true. But Nimoy was the breakout star when the show first aired — to the much-publicized chagrin of William Shatner — and rightfully so. James Tiberius may have been the captain, but the emotionless (on the surface) Spock was the soul of the show. Mr. Nimoy had the biggest load to carry, and as an outsider character he inherently spoke to sci-fi fans who themselves felt like outsiders. He spoke to nerds. But it went far beyond that. A couple of years ago, a post from the My Star Trek Scrapbook site went viral, showing the 1968 response that Mr. Nimoy had written to a bi-racial teen who felt utterly alone in the world and had written to Spock with her problems. Mr. Nimoy's response is epic, and profound, and gracious, and all the things you could ever hope someone would tell this girl. It also came in the larger context of the first bi-racial kiss on television and Dr. Martin Luther King, Jr. personally telling Nichelle Nichols that she had to stay on the show because of the boost it gave to the African American community at the time. This was all part of a very, very big deal. Mr. Nimoy always seemed to understand that it was all bigger than him, and he seemed to have felt obliged to give it his best service. The three-film arc of The Wrath of Khan, The Search for Spock, and The Voyage Home, of which Nimoy directed two, represents to my mind the franchise's most profound emotional storytelling. Star Trek wasn't his baby, but he raised it to the best of his ability. Mr. Nimoy's name has been synonymous in my mind with science fiction for my entire life. Even his actual name, "Nimoy," always sounded strange to my ears, unique, almost "Nemo," something I was familiar with, but just off. Like Spock himself, almost normal but somehow apart. Granted, he'd been playing Spock for over a decade before I was born, so I came into a world in which Mr. Nimoy was already woven into the fabric of popular sci-fi, but it always seemed to me like a very comfortable match. Thanks to his work, we are all a little better than we might've been, so his loss feels all the more profound.